Bonsai Myths exist are commonplace on the internet, in print and amongst many groups of enthusiasts. Akin to the computer virus, they raise their heads on occasions, are suppressed, disappearing from sight for a few months or years before reappearing again and again and again. 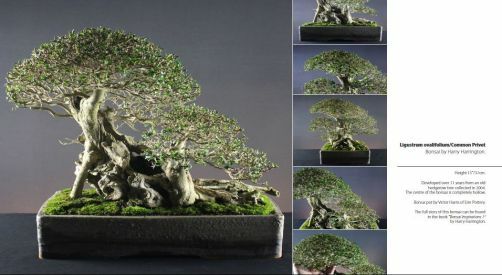 Though all evidence can be put forward to fight the myth, it only takes one popular bonsai title to perpetuate the myth for years; "it must be true, I read it in xxxx xxxx's book". The bonsai trader has read the book, the club member has read the book, the forum member has read the book and the myth is spread around and around and around. My first line of attack is aimed at Misting Your Bonsai Daily. Many beginners in particular are encouraged to mist their trees regularly, primarily to increase the humidity around the tree. No doubt that this does temporarily address the arid indoor atmosphere in which many bonsai are expected to exist. Unfortunately, misting only creates a temporary humid atmosphere. What does frequently occur is that the excess water from misting or spraying, runs off the leaves into the soil below. A frequently misted tree will in effect have water running onto the surface of the soil on a frequent basis. This can often create a soil structure where the surface of the soil is continually wet and airless; something that often leads to poor vigour and even root rot in trees, particularly in poor draining soils. The other problem with water run off is whilst the soil surface can be wet and indicate that the tree does not require watering, the underlying mass can be dry because there has not been sufficient run off to penetrate past the upper 1" of the soil mass. Because the enthusiast believes the soil is still damp he or she have failed to water the soil directly. How can you tell whether the soil is wet or dry if the surface is continually misted? Trees grown indoors do need misting once a week/fortnight. Leaves naturally collect dust and the easiest way of cleaning them is to give the tree a thorough misting or spraying. But that's all. A closely related myth. This myth instructs us not to water a tree in bright sunlight lest the leaves are burnt by the magnifying effect of water droplets. As a UK resident we rarely (never) experience sunlight strong enough to burn leaves, however well the water droplets might magnify sunlight. I have great doubt that the concave upper surface of a water droplet would be able to focus light onto a leaf in anyway at all. Anecdotal evidence from enthusiasts who regularly experience Summer temperatures of 100°F or more similarly have no experience of 'water induced leafburn' (!). My prime reason for disbelieving this myth is that if water droplets caused leafburn why does this event never occur when it rains on a hot day? Surely the myth would lead us believe that the trees around us would be burnt and possibly defoliated every time there was a rain shower during the Summer? To quote a more authoritative source, Professor Amy Liang in her book the 'Living Art of Bonsai' states that "if sunlight goes through a drop of dew directly, its energy is only 0.2 calories per minute. It is, therefore, incapable of burning leaves..........In addition, 1/4oz of water absorbs approx. 540 calories of heat when it evaporates , it is clear that instead of scorching leaves, water helps lower temperature (of the leaf surface)". So where does this myth originate? I believe it maybe a result of the old gardeners' advice to never water your garden during the day. Flowers and in particular, the flowers of garden annuals do spoil if they become wet whilst they are fully open during daylight hours. The reason they spoil has much more to do with the impact of heavy water droplets on the delicate, light petals of a flower than of any effect from the Sun. Spraying the leaves of outdoor bonsai with water can useful for reducing the effects of high summer temperatures and cleans the dust from the leaf surface but with reference to the first part of this article, it is not necessary on a daily basis and should only be carried out at the same time as watering a tree whose soil actively requires water*. *There are occasions when an outdoor tree needs regular misting but this is limited to specific cases such as yamadori/collected trees and healthy trees that have had recent major work carried out.